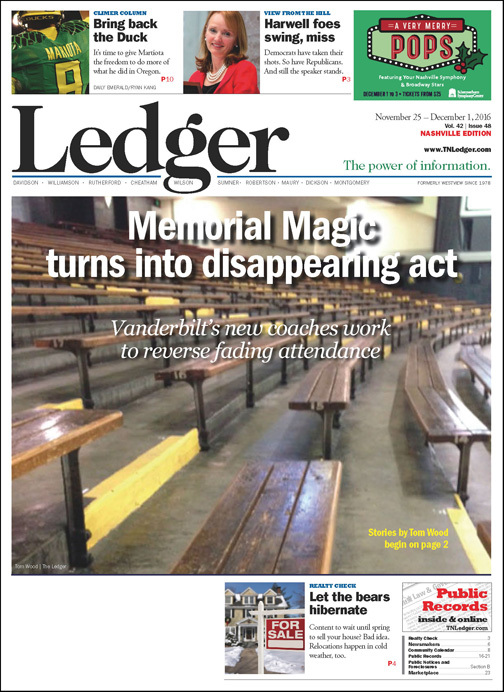 Memorial Gym Magic hasn’t exactly disappeared, but fans of Vanderbilt’s storied basketball programs certainly have. In droves. 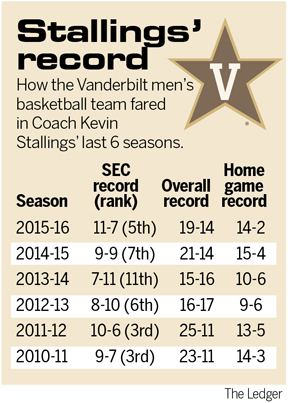 Only time will tell if new Commodores coaches Bryce Drew and Stephanie White can halt the attendance tailspin of the final six seasons under Kevin Stallings and Melanie Balcomb, but early indications offer hope of an upsurge both on the court and at the box office. 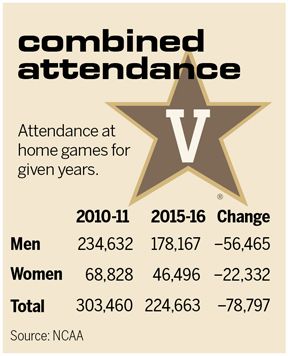 Vandy’s combined home attendance (men and women) dropped a staggering 4,207 fans per game in a six-season span from the 2010-11 season through 2015-16, NCAA attendance records reveal. Drew, who excelled as both a player and a coach at Valparaiso University, is the Commodores’ new magic man. He has been tasked with the job of re-igniting the fan base, of taking the program to the next level, of rekindling that missing aura and – once again – filling seats at one of the nation’s iconic gymnasiums. A high-achiever all his life, Drew is certainly aiming high for his fledgling program here. “Vanderbilt is a wonderful place to work. We’d love to build this into a national contender on a yearly basis,” says Drew, who signed a six-year contract in April to become the Commodores’ ninth head coach of the modern era. Winning will certainly play a key role in bringing fans back to Memorial, and Drew is committed to making it happen. But he knows the issues run deeper, and it won’t be easy to shake the fans’ malaise to the program over the past half-dozen years. Basketball is down, and the school’s basketball programs drew nearly 79,000 fewer fans this past season, dipping from a combined attendance of 303,460 fans in 2010-11 to 224,663 over the 2015-16 season. Men’s basketball suffered the greatest drop, falling an average of 2,667 fans per game from 13,802 in 2010-11 to 11,135 last season. The NCAA Division I average for that span was a loss of 282 fans per game. Nationally, the program ranked 18th in attendance five years ago and 36th last season. The Commodores had a winning record in five of those seasons (they finished 15-15 in 2013-14), and reached the postseason four of those seasons (three NCAA and one NIT appearance). Granted, average attendance increased by nearly 2,300 fans in Stallings’ final season – but so did expectations. And when those on-court expectations weren’t met, he decided to bolt for Pittsburgh. Why the stagnation? Many reasons, from mediocre teams and coaching to entertainment competition for Nashvillians and their disposable incomes. “There’s lots to do (in Nashville). As a society, there’s so many more things to do now,” Drew notes. “Every night you can go to a great show, go to a great restaurant. As far as basketball goes, well there are plenty of options there, too. Nashville is home to some great college hoops programs, with Belmont, Lipscomb, Tennessee State and – just a few miles away in Murfreesboro – Middle Tennessee State. And staying home to watch a seemingly endless supply of games on high-def TV – or following them on a mobile device – are other options that Vandy must compete against. “So many people are reaching out to grab people to do more things,” Drew explains. “And you have so many more things that you can hold in your hand and be more mobile, and do wherever. “You can watch any game you want at a restaurant or in the car or taking a walk outside on your phone, and you can go back and forth during every time-out, and watch several games in an hour. “So I think some of it has to do with the technology that’s come, and like you said, in Nashville there are so many things going on,” he adds. The sports world has changed since Drew was named Indiana Mr. Basketball and Indiana Gatorade Player of the Year in 1994 before becoming the most decorated player in Valparaiso history. But Drew hasn’t. Family values and a work ethic instilled by his father/coach Homer have shaped how he intends to rebuild the Commodores’ program. Drew and his staff, along with numerous Vanderbilt support staffs and new women’s coach White, have taken a grassroots approach to selling Vanderbilt basketball. The thinking is that to bring fans back, you have to talk to them like they’re your best friend inviting them over to the house for the evening. Look ’em in the eye, ask how they like the rebuilding project you’re doing, ask their advice on how to improve it, invite ’em to stay a while. And come back anytime. To that end, the Vandy coaches and staffs have been going out to various sites around town, shaking hands and inviting potential fans to come see what’s happening on West End. “It’s been a joy to get out and meet a lot of people and try to get them to be Vanderbilt fans. Hopefully, that will bring them to come watch our team, and hopefully, that will bring them to cheer when they’re watching on TV,” Drew adds. Martin Salamone, Vanderbilt’s new associate AD of sales, marketing and revenue generation, says the new coaching staffs have been more than willing to get out and beat the streets for more fan support, making his job much easier. Like that 1950’s Richard Boone Western television show, it’s sort of a “Have Coaches - Will Travel” message. “We’re trying to meet the sidewalk fans. Just the everyday fan. We certainly want to reach out to Vanderbilt alums, we want to reach out to Vanderbilt employees, the students and those who are connected to Vanderbilt, but we also want to stretch it,” Salamone explains. To that end, the coaches have had meet-and-greets at meat-and-threes like Arnolds, they’re poured it on thick as syrup at Pancake Pantry. Rotary, Kiwanis, you name it, they might have already been there. And if they haven’t yet, call Salamone. He’ll get them to your neck of the woods soon enough. “Bryce is a bit of a foodie, and he loves the different restaurants in town,” explains Salamone, who has also launched digital ad campaigns and more modern social media to get the message out. “It’s funny, he’ll be out talking to people and they’re like, ‘where have you eaten?’ And he asks them, ‘well, where should I eat?’ It’s really genuine, just to shake hands. Joe Favorito, a sports marketing professor at Columbia University, says he thinks Vandy is on the right track – especially when trying to sell the new coaching staffs to the fan base. “I’m a big believer that college coaches are under-marketed values, because they are the only constant the university has,” Favorito says. “And I think a lot of schools and a lot of professional teams sometimes forget the fact that their biggest constant is the person at the head. Not only is he or she the biggest constant, he or she is the person that’s seen most on television, and it’s really the strength of the program. “And in a day and age where athletes are very transient, that’s the one constant,” he adds. 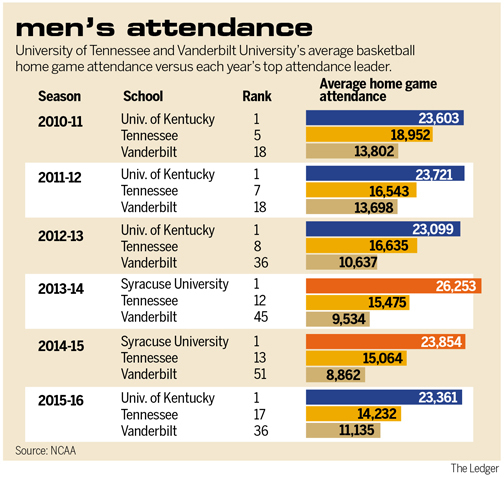 Favorito notes that Vandy isn’t the only school – and basketball isn’t the only sport – with attendance issues in recent years, and the NCAA attendance figures back that up. Even with 11 more teams playing D-I basketball, total attendance is down 359,942 from 2010-11 to 2015-16 and average attendance was down 282 per school last year from 2010-11. “It’s not really tied to just to schools. You’re seeing that in almost every sport and every place. The NFL has a smaller problem than other sports,” Favorito explains. “People now, especially young people, are more distracted, have more options, have the ability to consume media in various ways. And sometimes think twice about going to X number of games versus cherry-picking the ones they really, really want to go to. “It’s not a secret, but it’s now become a place where people are not going to show up just because a team is playing. They have to have added value. And teams and schools have done promotions for years. The launch of the VU women’s White era has gone much the same way as the men, preaching the same message as Drew. Like her counter-part, White was one of the best players to ever come out of Indiana. Their career paths crossed many times over the years, and both think it’s pretty cool that they’ve intersected once again at Vandy. “I think we have great synergy in our staffs. Obviously, we have a history,” White points out. And like the men, the women’s program has seen slippage in attendance over the last few years of the Balcomb era. Women’s attendance fell an average of 1,603 per game during that six-year span, from 4,589 per game (20th nationally) in the 2010-11 season to 2,906 last season (37th). The Commodores reached the NCAA Tournament for the first four years of that span under Balcomb (now an offensive analytics assistant at South Carolina), but failed to make the field the last two seasons. If Drew takes the program where he expects, he knows it’s going to be done through recruiting. The men’s talent cupboard for this year’s men’s team isn’t bare – not with the likes of 7-foot-1 center Luke Kornet and guards Matthew Fisher-Davis and Riley LaChance – but Vandy lost two players who left school early for the NBA in Damian Jones and Wade Baldwin. “Our recruiting has really gone well. We signed three players early. We expect all of them to have great careers here at Vanderbilt,” Drew says. Vandy’s early recruiting effort was judged 39th best in the nation by 247.sports.com, and the seventh-best in the SEC. The Commodores landed 6-9 center Ejike Obinna of Virginia Academy, 6-1 point guard Saban Lee of Tempe, Arizona, and 6-2 guard Maxwell Evans of Bellaire, Texas. It’s a start, though whether it translates into seats sold remains to be seen.